This week's content is brought to you by Risun Udawatta. In its recent IPO filings, Lyft describes itself as operating within the Transportation-as-a-Service (TaaS) industry – also referred to as Mobility-as-a-Service (MaaS). Lyft defines TaaS as an on-demand service for an array of transportation options, including ride-hailing and carpooling. In the past year, it’s come to also include short-term bike and scooter rentals. The growth of TaaS represents a marked shift away from the historical model of personally-owned vehicles as the primary means of transportation. Ride-hailing networks connect riders with local drivers, giving riders a door-to-door transportation option. Carpooling services connect drivers with other passengers looking to travel to the same long-distance destination, sharing the cost of the journey between the driver and passengers. Ridesharing is the juxtaposition of the two, wherein passengers share a ride, usually intracity, that is going in the same general direction. The emergence of bike and scooter rentals has supplemented these transportation options, by providing consumers more convenient first- and last-mile options. Bike and scooter rentals give consumers the option to pick up and drop off these rentals virtually anywhere they are present. Lyft claims its platform is available to over 95% of the U.S. population as well as in select Canadian cities. If TaaS is to replace traditional transportation models, Lyft’s total addressable market is the transportation spend in the U.S., into which it is steadily expanding its TaaS network. In 2017, U.S. households spent approximately $1.2 trillion on transportation, making it the 4th largest consumption expenditure behind health, housing and food. 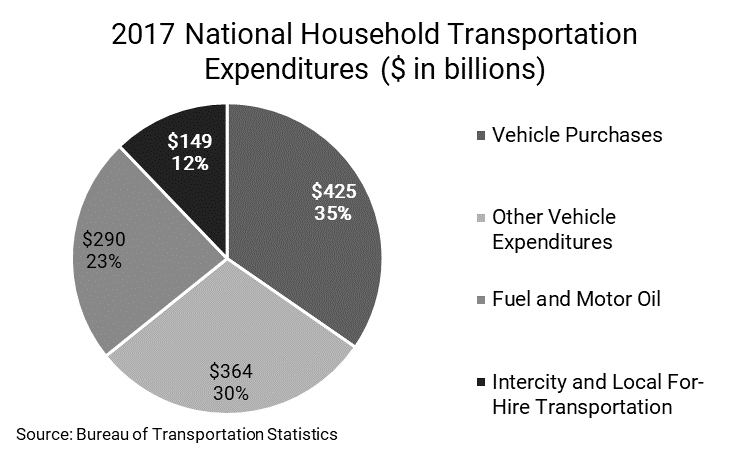 Transportation expenditures include vehicle purchases, other vehicle expenditures, fuel and motor oil, and intercity and for-hire transportation. 88% of all transportation-related household expenditures were spent in relation to vehicle ownership. Of the $149 billion spent on intercity and local for-hire transportation, 64% was spent on airlines. Given its current offerings, Lyft aims to capture transportation spend, excluding airline dollars, an approximately $1.1 trillion market as of 2017. As of 2018, Lyft generated $2.2bn in revenue, which translates to only a 0.19% market share, indicating Lyft has plenty of greenspace to grow into. TaaS providers bill their platforms as a more affordable and convenient option to owning a car or using public transportation. Technology has drastically reduced the cost of these services – once reserved for the affluent classes – by matching riders with drivers who use their own vehicles. In tandem with technological advancements, factors such as cost of vehicle ownership and urbanization are pushing people towards TaaS platforms. For Lyft to realize its lofty ambitions, the company will need to convince broader society that its services can replace car ownership. Outside of purchase price, the cost of vehicle ownership is a major consideration when deciding to buy an automobile, and Lyft needs to show people that its platform will save them money and/or serve as a more convenient option. Since 2000, the cost of vehicle ownership has increased 20% in the U.S., based on data compiled by the Bureau of Transportation Statistics. The largest factor in rising costs was maintenance, increasing 128% in the same period. While oil prices are at historical lows, gas costs increased 60% between 2000 and 2018. 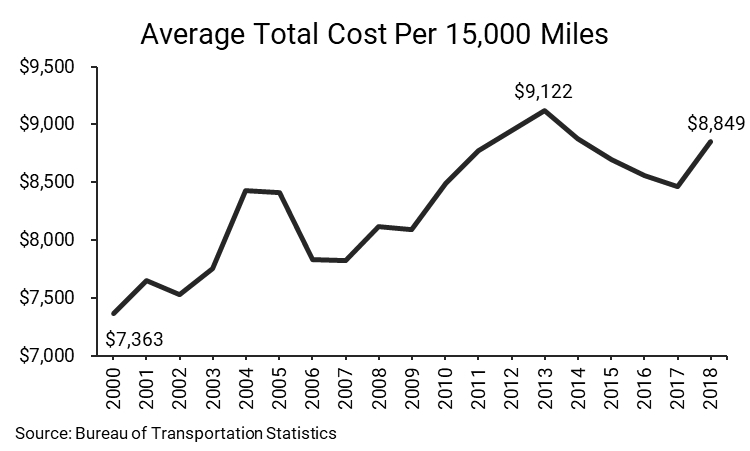 If this trend continues, more consumers may forgo owning vehicles and opt to use public transportation or ride-hailing services if they prove to be more cost-efficient. Moreover, urban migration may amplify the adoption of TaaS. Lyft and other platforms have largely succeeded in urban areas and particularly in cities where public transportation options are lacking. 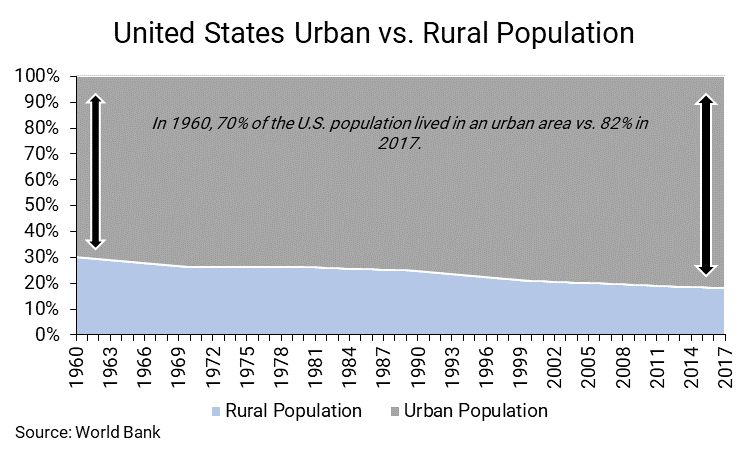 As the figure below illustrates, in the United States, urbanization has steadily increased, with 82% of the population living in urban areas – the U.S. Census Bureau defines an urban area as a city that contains 50,000 or more people. This trend bodes well for the TaaS industry, because the total addressable market increases as the population mix continues to favor urban areas. Traditionally, urban areas have provided public transit as an alternative mode of transportation, born out of the increased cost of owning a vehicle in a city (e.g., the cost of parking is too high). Unfortunately, public transit hasn’t effectively kept pace with the influx of people. As a result, urbanization, cost of ownership, and lack of public transit are creating an environment ripe for Lyft and its competitors. Lyft is capitalizing on this market dynamic, having grown over 200% and 100%, respectively, over the last two years. As people weigh the rising cost of car ownership, more people will adopt TaaS. However, players like Lyft will have to keep the costs of their services down in order to entice people to give up on traditional vehicle ownership. The key questions remains – can Lyft convince people to fully embrace TaaS while satisfying profitability pressure from their new public investor base?